—Clayton Christensen, bestselling author of How Will You Measure Your Life? Based on the wildly popular commencement address, the art of asking (and answering) good questions by the Dean of Harvard University’s Graduate School of Education. Whether we’re in the boardroom or the classroom, we spend far too much time and energy looking for the right answer. But the truth is that questions are just as important as answers, often more so. If you ask the wrong question, for instance, you’re guaranteed to get the wrong answer. A good question, on the other hand, inspires a good answer and, in the process, invites deeper understanding and more meaningful connections between people. Asking a good question requires us to move beyond what we think we know about an issue or a person to explore the difficult and the unknown, the awkward, and even the unpleasant. 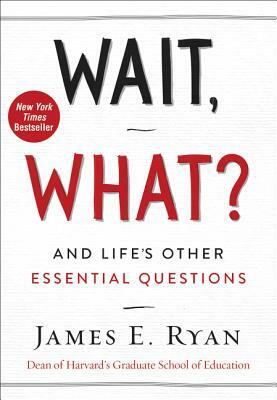 In Wait, What?, Jim Ryan, dean of Harvard University’s Graduate School of Education, celebrates the art of asking—and answering—good questions. Five questions in particular: Wait, what? ; I wonder…? Couldn’t we at least…? ; How can I help? ; and What truly matters? Using examples from politics, history, popular culture, and social movements, as well as his own personal life, Ryan demonstrates how these essential inquiries generate understanding, spark curiosity, initiate progress, fortify relationships, and draw our attention to the important things in life—from the Supreme Court to Fenway Park. By regularly asking these five essential questions, Ryan promises, we will be better able to answer life’s most important question: “And did you get what you wanted out of life, even so?” At once hilarious and illuminating, poignant and surprising, Wait, What? is an inspiring book of wisdom that will forever change the way you think about questions. James E. Ryan is the eleventh dean of the Harvard Graduate School of Education. Before joining Harvard, he was the Matheson & Morgenthau Distinguished Professor at the University of Virginia Law School, where he founded the school’s Program in Law and Public Service. He is the author of the nonfiction work Five Miles Away, A World Apart. A former clerk for Chief Justice William H. Rehnquist, as well as a former rugby player, he has argued before the United States Supreme Court. He lives with his wife, Katie, in Lincoln, Massachusetts, with their four kids, two dogs, two cats, and nine chickens. — Clayton Christensen, bestselling author of How Will You Measure Your Life?